Although Dragon Quest VII continues to be the focus of the time I spend with my 3DS systems, that doesn't mean I'm ignoring every other game released for the handheld. 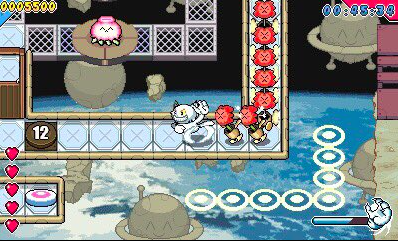 Aero Porter--I've wanted to play this Yoot Saito-made puzzler since it was first revealed to be a part of Level-5's intriguing Guild01 compilation. As is too often the case for yours truly, I failed to buy it upon release and then basically forgot about it until I saw it would be included in a Black Friday sale on the North American 3DS eShop. That was all I needed to jump in with both feet. (I purchased The Starship Damrey at the same time, though I've yet to even boot up the curious-looking survival-horror title.) With that out of the way, I played Aero Porter throughout my recent three-day move--of sorts--from Seattle to California. If you've never before heard of Aero Porter, the gist is that you have to manage all of the baggage coming into and going out of an airport. Not the most thrilling of premises, I agree, but it's definitely unique. Also, it produces gameplay that's a lot more compelling than I ever imagined. Unfortunately, it also produces gameplay that's a bit too frantic for my liking. As such, although I currently love and respect the idea of Aero Porter, I'm not sure that's going to translate to me putting much more time into it, as I'm already feeling stumped. Don't worry, I haven't completely given up on it, but I may have to do just that if it becomes clear it's not a good fit for my feeble brain. Regardless, I'm glad I finally bought it, and I still think it's worth trying if you tend to like portable puzzle games. Go! Go! 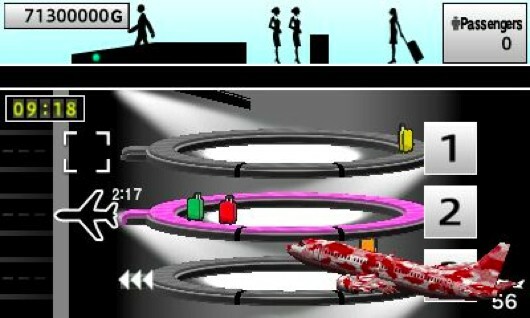 Kokopolo--This indie title was first made available to the gaming masses back in 2011 via Nintendo's DSiWare service. Later, it made the transition to the 3DS eShop--though its developer mysteriously pulled Go! Go! Kokopolo from the European and North American versions of that digital storefront in late 2014. For whatever reason, Go! Go! 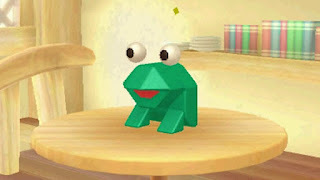 Kokopolo can still be found on the Japanese 3DS eShop--which is where I bought my copy after publisher Circle Entertainment reminded me of its existence while promoting the game's upcoming 3DS sequel. I'm now sad I waited so long to experience this wonderfully weird title, which calls to mind classics like Enix's Door Door and Namco's Pac-Man. Here, you're plopped into the paws of an ever-grinning cat named Kokopolo and then tasked with corralling each stage's creatures into the hungry stomach of what the game's makers describe as a carnivorous plant. As for how you accomplish that, you do it by waltzing up to one of said creatures, swiping at it with your claws, making it angry and then leading it to the above-mentioned plant when it inevitably gives chase. It's a lot of fun and doesn't require a huge investment of time or energy. (In other words, it's one of those play-when-you've-got-a-few-spare-minutes games that are so great when you're busy.) Plus, it's a real looker, with pixel-based graphics that remind of Saturday morning cartoons. 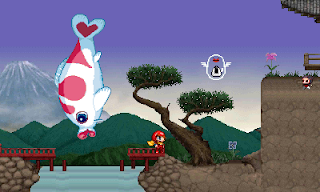 Ninja Jajamaru-kun: Sakura-hime to Karyu no Himitsu--I don't have much experience with Jaleco's Ninja Jajamaru-kun series. I've played a bit of the Mario Bros.-esque Famicom game from 1985, but that's it. Not that Sakura-hime to Karyu no Himitsu plays anything like that antiquated title. This modern sequel is a fairly by-the-numbers platformer--with tossable shurikens, naturally. It attempts to make up for its staid gameplay with colorful backdrops and well-drawn character and enemy sprites, but the latter fall a tad short of the mark due to their annoyingly diminutive size. Granted, of all the games discussed in this post, I've put the least amount of time into Ninja Jajamaru-kun: Sakura-hime to Karyu no Himitsu. Given that, it's entirely possible its adventure turns a corner at some point down the road and becomes thoroughly thrilling. Should that prove to be the case, I'll let all of you know in an upcoming write-up (perhaps even in another "Great Gaymathon" review). **Bonus** Picross 3D: Round 2 (demo)--I also recently downloaded and played through the Picross 3D: Round 2 demo that Nintendo added to the North American 3DS eShop. This despite the fact that I've barely touched the Picross DS cartridge I bought ages ago and have yet to even pick up 2009's much-balyhooed follow-up, Picross 3D. Still, the original Picross 3D gets so much love on line that I couldn't ignore the chance to experience a bite of its digital-only (in my neck of the woods, at least) sequel. As for my impressions of Round 2's demo: I really, really liked it. It's polished to the hilt, as so many Nintendo-made and -published products are, plus there's plenty of substance below that shiny surface. That said, I've got to admit I think I prefer the more straightforward rules and gameplay associated with traditional Picross to this three-dimensional offshoot. The former's certainly easier to boot up and zone out to, in my opinion, and that's usually what I want from a puzzle game these days. Who knows, though, I may change my mind and import a copy of the Japanese version of Picross 3D: Round 2 later this year when it finally dawns on me that the days of the 3DS are nearly over.